Yasmina Khadra literally means green jasmine and is the pen name of the Algerian author Mohammed Moulessehoul, adopted by him to avoid military censorship—he was at one time an officer in the Algerian army. 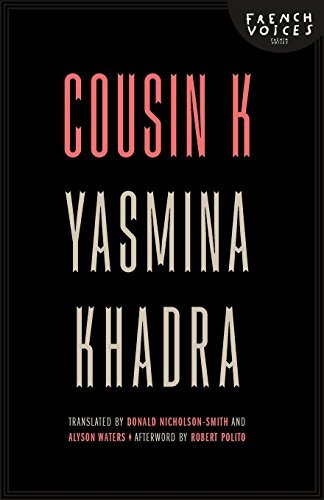 His latest work, Cousin K, is a novella and at 96 pages including the Afterword by Robert Polito, a quick read. Yet in that hour or so Mr. Khadra takes the reader on an emotional journey so disturbing, with an ending so shocking, that the only option is to go back to the beginning and start it again. Is the narrator cursed in some way, one of those people whom good fortune always manages to avoid? Certainly there will be many readers who empathize with hating school, being the youngest of three children and the one seemingly left out. The name of the narrator is never given, but that is more than made up for in the dark secrets that are skilfully and dramatically revealed as the end draws near. There are eloquent and sensuous descriptions that almost trick the reader, rather like a car passenger enjoying the scenery but with a nagging worry about where they are being led. Almost at the end, Mr. Khadra provides just enough to allow the reader to worry, then delivers the shocking confirmation. Cousin K may be a small book but it is a giant of a literary work. The good thing about the size is that it fits into a pocket or purse with ease, enabling the reader to keep it at hand and dip into a magical world of the flawed and broken heart at every opportunity. Steve Emmett is a British author born in Harrogate, the genteel Yorkshire spa town where Agatha Christie hid away from the world. He grew up on Dennis Wheatley novels and Hammer horror films, fueling much of the tone of his debut horror novel, Diavolino, which is available as an ebook and paperback. His tongue-in-cheek A-Z of Understanding Italians is available for Kindle.